Our intrepid group departed Xining Caojiabao Airport on 15 February in a small fleet of Land Cruisers (necessary because of some anticipated road conditions). We spent three days in Repkong visiting a Bon monastery for the Maitreya kora, watching a Shaman festival, experiencing Cham dancing at Magotsang, participating in a Butter Tea Ceremony and Displaying the Thangka at Gomar, and also visiting friends made over our previous sixteen years of visiting (!). 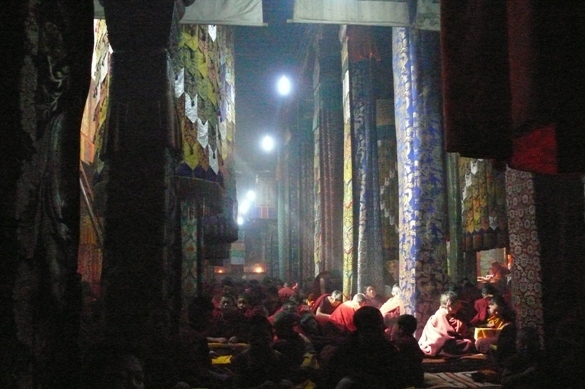 Wenjia Bonya Gompa - Maitreya kora. Shaman showing that fabric offerings must be lifted then hung from the ceiling. Then we headed east toward Labrang Monastery and after lunch turned south for an overnight stop in Zoige before heading onward to Ngawa (Aba) for three and one-half days. Ngawa is in the Kham region of Sichuan province, and has a variety of monasteries in the local area. We were fortunate to visit Gomang Gompa / Gomang Gar Ganden Labsum Zungjuk Dechenling (Gelug), Kirti Gompa / Kirti Kalari Gon Tashi Lhundrub (Gelug), Narshi / Nangzhik Gompa / Gyelten Phuntsoling (Bon) and Se Gompa / Setenling (Jonang). Gomang Gompa Displaying the Thangka. The Displaying the Thangka celebration was special at Gomang Gompa because the Living Buddha was present along with the Necheng Oracle. Both arrived and departed on horseback, compete with mounted retinue of guards. But there was a lighter moment prior to their arrival when two monks at the top of the displaying hill lost their hats which fell onto the thangka. We were fortunate enough to visit Se Gompa, an important Jonang monastery. It is home to over 600 monks and many of them are very young. Inside Assembly Hall at Setenling Gompa. 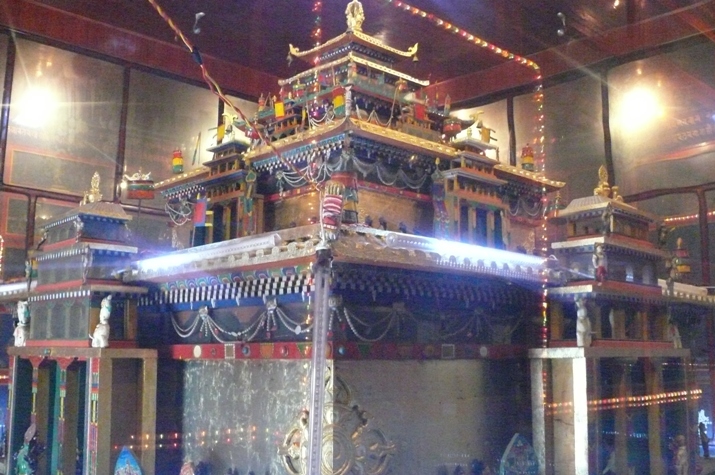 A small temple, the Dukhor Lolang, contains a lovely three-dimensional mandala of Kalachakra. While at this friendly monastery, I witnessed a monk cleaning two horns, also known as flageolets or gyalings. How he did it I found unusual and interesting! Ngawa (Aba) was home base for our excursions into the local Kham area and the main monastery located in the town is Kirti Gompa. It is a very large gompa and houses almost 1000 monks, many of whom are primary school age or younger. It snowed quite heavily while we were there and the young boys had great fun making snowballs and throwing them at senior monks before dashing off to avoid any repercussions! Meanwhile, the followers huddled to keep warm. One of the special features of the Kirti Gompa Losar celebrations is the parade of horses. This is a celebration of the major part that horses play and have played in local history, culture and daily life. Young men, and sometimes young boys, parade their horses into the monastery carrying monastery flags. This year there were over 100 horses in this spectacular procession. Although the snow caused a few problems, the Cham dance continued on schedule although some parts of it were shortened. The cham dance was a combined Shanag Cham and Yama Cham. At the conclusion of the Shanag portion, the threadcross and parchment scroll are burned in an oil-filled cauldron. The dancers then line up in front of the Tsenyi Dratsang (Dialectic College) and proceed with the Zor to the entrance of the monastery and then to a clearing where the Zor is burned. Late the following afternoon at Kirti we witnessed a display of strength as a select group of local young men struck a large mis-shapen tree trunk with thick long white poles. The intent was to drive evil emanations from the tree trunk which had been imbued with them over the course of the previous year. In so doing, the wooden pole (about two meters in length) would break. The idea was to strike the tree trunk twice and each time to break off a piece of the pole. I called this activity Spirit Bashing; the link below will lead you to a more complete story of this interesting piece of local history and lore. The snowfall during our visit to Ngawa caused a delay in many activities. The Kirti Gompa Displaying the Thangka ceremony was delayed by one day but we were able to participate in this activity early in the morning of our departure from Ngawa. The thangka was hauled up a large tower in a manner never seen before by your scribe. 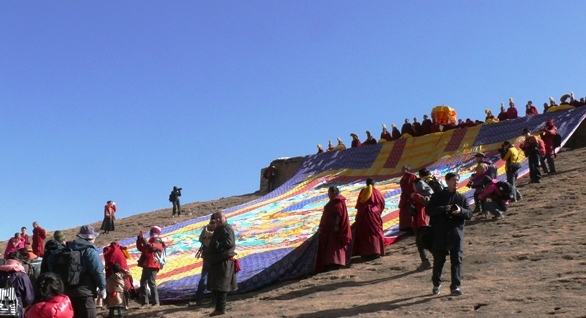 The thangka measured approximately 30meters wide and 40meters tall. Before leaving Ngawa, we took time to visit a Bon monastery called Nangzhik Gompa, or Narshi to the locals. Its formal name is Gyelten Phuntsoling. 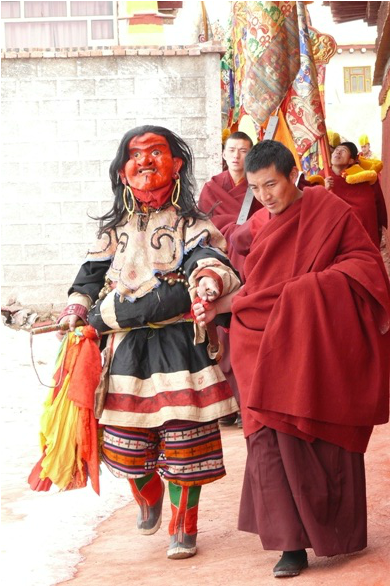 While there we were able to witness a Circling Dance whereby all the monks at the monastery, 700 approximately, parade around the Inner Kora lead by a red-masked dancer. While it was difficult to leave the Ngawa area, we had to leave after almost four days. We needed to keep a rendevous with the spirit of QianLong and the siege of the Gyalrong Gorges. So off we headed towards Danba and their protective towers. The Gyalrong Gorge towers have a very interesting history. The towers are rectangular (4-sided), 6-sided, 8- , 12- , 16- ; their is one tower that has 24-sides (!!) and this is sufficient to cause me to return in the summer to locate, visit and photograph it. Meanwhile, please read the story below which provides much more information about The Fortress Towers of Danba. Our Tibetan New Year 2016 excursion ended when we were to fly out of Kangding Airport, located in Sichuan province to the west of Chengdu. It is the third highest airport in the world at 4,200 meters (almost 14,000 feet) and, since we had experienced a major snowfall in the region, we discovered that the airport was closed because the runway was too icy and the one plane a day could not land. So we left the airport at 1030hrs and drove through packed snow (jammed with Chinese drivers), managing to cover the high altitude 40 kilometers in about four hours (!). We reached Chengdu shortly before midnight. A wonderful trip! And we are already outlining a return next year for what we will call TNY2017. Join us! !